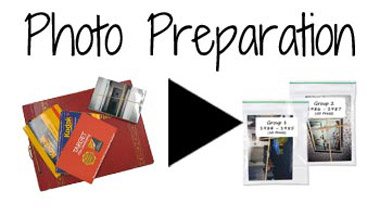 If your prints are being stored in an album, you will want to take them out. Prints left inside an album will incur a 10 cent handling fee per print. If you don't want to deal with the hassle of getting your prints organized, we will scan them as they arrived. If you want to organize your prints after they have been scanned, you can use our online image organization system. If you already know the grouping that you want your photos scanned in, just put each group of photos inside gallon size Ziploc bags. Label each bag with a name or identifying group number. Include a note explaining how you have organized your photos & how you want them organized. This way there won't be any confusion. prints must be scanned by size, so we cannot guarantee the sequence WITHIN each group. If you want to adjust the sequence of your images within the groups, you can use our online image organization system. Fill our order form, if you need help at any time, don't hesitate to call us at 1-800-776-8357. Place all your items in a shipping box with packing material so that your photos are not jumbled around in the box. Make sure you include your order form in your box so we know who the photos belong to when they arrive. We do not recommend using the Post Office to ship your photos. Step 8: We Take Care of the Rest!